Out of chaos you brought order. Out of nothingness you brought life. In the middle of all life stands the tree. Trees provide the air that nurtures all your creation. Birds make them their homes. Cats climb them for protection. Trees recycle life that has come before. Bless the trees of this word, loving God. Remind us to serve as their caregivers and protectors. Give them long limbs and long life. The gift of their breath is as special to us as the breath of the Holy Spirit. Last year we lost a tree in our front yard. It had been sick when we first moved in and nothing the tree doctors could do would save it. A mold had taken it's life. So last fall we had it removed and replaced with this tree - a Black Gum - that has beautiful fall leaves. Mixed in with the soil are ashes from our beloved cats, Freedom and Erik Brockley. 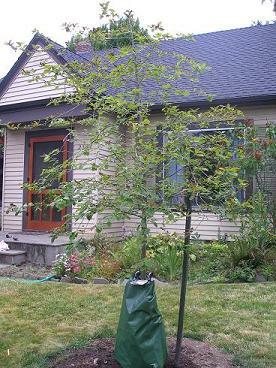 In the Portland climate this tree should do well. Unfortunately, we're not the best garden people and during this spell of hot weather our tree didn't get the water it needed and many of the leaves have burn. Liz has fixed that problem and the tree should be good to go. But being a minister it seemed a prayer was called for. Google couldn't provide me with any (don't people pray for trees?) so I wrote the one above for our tree and for all trees. Frances and Katherine joined me in offering this prayer as we held hands around the tree.